Hi, everyone! I just got a message from Doris, courtesy of Vashti Braha. Doris is without power, so no Internet. She wants everyone to know that, she's safe on high ground with no storm damage. All contest entries she's received so far are safe and sound! 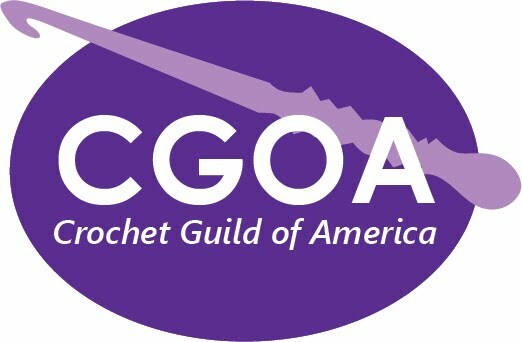 I hope all our CGOA members in areas affected by the storm are also safe and sound. Due to recent geological and meteorological events, the entry deadline for the CGOA 2011 Design Competition has been extended to 6 September. If you entry will be arriving after 31 August, please let me know at the e-mail address listed in the official competition information. No worries. Be safe. $1000 Grand Prize, sponsored by Crochet Partners and Interweave Press. Judging will take place on location at the CGOA Conference in Greensboro, North Carolina, 21 September and winners will be announced during the Awards Ceremony on 22 September. You do not have to be present to enter or to win but you will want to be there to marvel at the awesome display of entries and unveiling of the winning designs. If you are preparing to ship your design, please fill out and submit the electronic entry form now and make sure that it exactly matches the crochet pieces you are sending. You will receive an e-mail confirmation letter, which is your form returned. Please make a hard copy of that returned form and include it in your package. See the official information pages at crochet.org for compete details. Deadline for entries is 31 August. Best of luck!